We invite you to explore India - the Land with infinite beauty ! Whether you soar high into Himalayas or peer under the ruins of the Ancient monuments dotting the landscape of India, you will cherish the experience long after your visit ! This India Travel Guide on Brahmagiri Wildlife Sanctuary is free from any commercial interest! This site is dedicated to promote India - the vast subcontinent, its glorious past, magnificent landscape and its infinite variety. Named after Brahmagiri, the highest peak in Karnataka, this wildlife sanctuary is situated in the Western Ghats, in the Coorg district of Karnataka. At 1608 meters above sea level, this hill range borders Kerala and Karnataka. It is situated between Wyanad District of Kerala state on the south and Kodagu District in Karnataka on the north. In the east it mingles with Nagarhole National Park. The sanctuary is spread about 181.80 sq. km. Brahmagiri has two reserve forests, Brahmagiri and Urty, with the river Borapole passing through. The sanctuary is rich in flora and fauna. The vegetation in the sanctuary is mostly evergreen and semi evergreen forests. Patches of shola forest with bamboos can also be spotted. Among animal species, lion-tailed macaque, elephant, gaur, tiger, sloth bear, wild pig, spotted deer, Nilgiri langur, wild do, Sambar, spotted deer, Slender Loris, Bonnet Macaque, Common langur, Barking deer and Mouse deer, Malabar giant squirrel and flying squirrel, Common otter, Brown Mongoose, Civets, Porcupine and Pangolin and several others can be spotted. Reptiles like python and king cobra can be seen. The bird species numbering around 240 include emerald dove, black bulbul, Malabar trogon among others. The sanctuary is famous for bird and jungle safaris. It is also an ideal place for trekking and climbing. Other places of visit near the Brahmagiri sanctuary include Thiruneelai temple, Pakshipathalam and Iruppu falls. The Thiruneelai temple was built by Lord Brahma himself and is dedicated to Lord Vishnu. Celebrated as the Kasi of the South or Dakshina Kasi, it lies on the side bordering Kerala. The temple boasts of 30 granite pillars built in traditional style. Pakshipathalam which is another major attraction lies on the Kerala side of Brahmagiri range at an altitude of 1740 meters. According to legend the cave in Pakshipathalam was used by Gurus and Rishis in primeval times. This place is also popular as Munikal cave in Karnataka. The Iruppu Falls originate from the Lakshmana Tirtha River in Karnataka. This is a most sought after destination in Karnataka. According to folklore, Lord Rama and Lakshmana stopped here whilst searching for Sita. It was here that Lord Lakshmana shot an arrow to Brahmagiri hill from where Lakshmana Tirtha River sprang. It eventually flows into the Kaveri River. The hill is at an approximate distance of 270 km from Bangalore and if you are trekking from Kerala, you can begin at Thiruneelai temple. Whilst trekking from Karnataka, Iruppu falls can be the starting spot of the trek. However, permission from the Thiruneelai Forest Range officer and Srimangala Forest Range officer has to be obtained while trekking. The nearest towns to Brahmagiri hill are Kutta. Srimangala and Gonikkoppal. Take along a trekking guide. This sanctuary is about 60 km from Coorg and about 270 kms from Bangalore. By bus from Bangalore, there are options to go to Gonikkoppal and thereafter Srimangala, and travel 10 km before reaching Iruppu falls. The trekking journey can begin from here. By car from Bangalore, drive through Mysore road to reach Srirangapatna. Take a deviation from Hunsur and proceed to Gonikkoppal. On the way to Gonikkoppal take a deviation towards Nagarhole. Srimangala and Iruppu. Drive through Ponnampet, Hudikeri and Shettigir, reach Srimangala and head to Iruppu. By bus from Kerala, reach Kuttu to Kattikulam, and thereafter a private bus to Thiruneeli from where the trek can begin. The nearest airport is Bangalore. It is also reachable by road and rail with Mysore junction as the nearest railhead. The route from Mysore is through Hosur, Gonikappa and then the sanctuary. From Madikeri, travelers go through Virarajendrapet and then to the sanctuary. 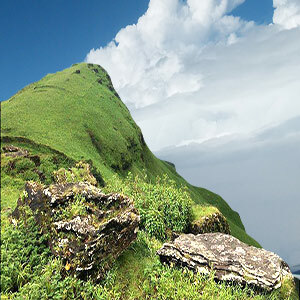 The best time to visit Brahmagiri is from October to May. Pack your bags and head to this paradise. You do not have to be a trekker to relish in Mother Nature's delight.